WARNING: GRAPHIC CONTENT. Philippines President Rodrigo Duterte's war on drugs has pushed the death toll to 5,927 since he took office in June vowing to get rid of narcotics in the country. The radical leader insists he is not a killer, despite the country's streets being littered with dead bodies due to his crackdown on illicit drugs (main and inset). President Duterte said he is not about to pull the plug on his operation, but would happily allow citizens to enjoy Christmas and New Year in peace if people stopped taking drugs. This is the emotional moment a woman was told her younger sister had been found alive more than 30 hours after she vanished during a works Christmas party. 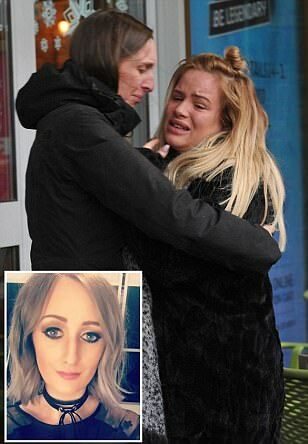 Make-up artist Kirstie Prince, 27, (pictured right) had mounted a frantic search for mother-of-two Louise Maloney, 24, (left) after she was last seen at 2am on Monday during a party in central Manchester. Boutique shop girl Louise - who rarely goes out - had left her daughter, aged five and son aged three with a babysitter so she could go to her work Christmas party. Police have closed streets in central Peterborough after a 'beeping' public bin caused a bomb scare. Unite members employed by Wincanton at an Argos distribution centre in Burton-under-Needwood, Staffordshire, will walk out for three days from next Tuesday. Elaine Ford, from Stirling, was giving evidence at the trial of former lover Nathan Gray, who is accused of abducting and assaulting her after she broke up with him. Management consultant Jim Boyden, 38, is one of the 300,000 passengers who rely on Southern services each day as he commutes to London from his home in Shoreham, West Sussex. 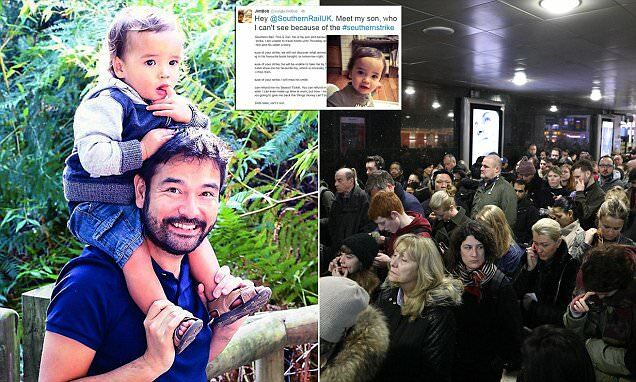 As thousands of furious customers took to Twitter to vent their frustration, Mr Boyden shared a photo of his one-year-old Zac (left) with a message (inset) explaining that he will miss the toddler's bedtime story because of the strikes. Thousands of commuters packed on to already crowded London Underground and London Overground carriages, as well as trains operated by other rail companies, as they struggled to find alternative routes to work after their regular Southern trains were cancelled as part of the 48-hour walkout (right, Victoria Underground station). The fireball crashed down in southern Spain at about 10.25pm on Sunday and the huge streak of light in the sky was witnessed by tourists and residents in the Costa Del Sol. WARNING: GRAPHIC CONTENT Adrian Brown, 38, of Forest Hill, south east London, has been charged with attempted murder, possession of an offensive weapon and assault. Karen Matthews, who was jailed for eight years in 2008 after faking the kidnap of her own daughter, wants to make her nose smaller in a bid to stop people attacking her in the street. WARNING: GRAPHIC CONTENT. Jake Jones, pictured suffered a broken leg, fractured ankle, fractured arm, damaged spleen and bruised lungs following the hit-and-run in Birmingham. 1.1k shares Where are the cast of Love Actually now? 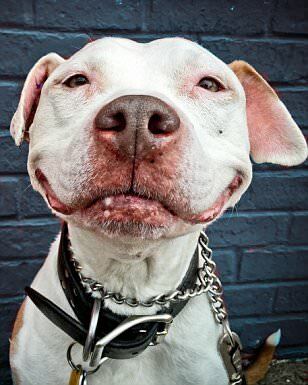 The BBC meteorologist (pictured) died on Saturday. Famed for his gentle Scottish accent, he was known by millions for his light-hearted presentation of the weather forecast. Muslims Like Us (pictured) is the two-part BBC2 reality show that puts ten Muslims in a house in York and gleefully films their furious arguments over faith and Islamic culture. Jeremy Clarkson introduced the stunt on the Amazon show, which was filmed in Whitby, North Yorkshire. He joked that he was about show 'a better way for immigrants of getting into Britain'. Benefit claimants were overpaid £3.3billion last year as blunders by officials and fraud jumped by 10 per cent. Baroness Bakewell, left, said it showed government incompetence. Not a single hospital or health trust in the UK is thoroughly examining patient deaths to check for avoidable errors, a report from the CQC released today has revealed. Southern Rail repeated warnings that around 500,000 regular passengers who live south of London should not bother trying to travel as it lost a legal battle to avert the action. Four men from Derby aged 22, 27, 35 and 36, a man, 27, from Burton upon Trent and a woman from London have all been arrested on suspicion of engaging in the preparation of an act of terrorism. Researchers pointed to healthy lifestyles and good incomes as key reasons why pensioners around London have formed a longevity belt unmatched elsewhere in the country. The number of children who have called a charity helpline for counselling about their gender identity has nearly tripled in three years, the NSPCC said yesterday. 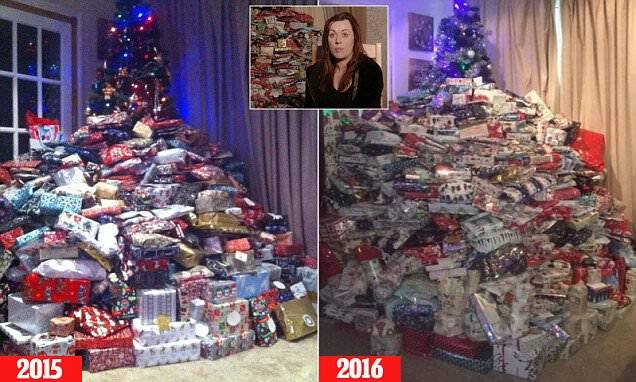 Emma Tapping, 28, from the Isle of Man, inset, will be making sure they each get 96 gifts - even though they still haven't used many of the items they were given last festive season. She was accused of 'abusing' and spoiling her children by lavishing them with the gifts that cost £1,500 in 2015, left. But the mother-of-three said the criticism hasn't put her off spending lavishly again this Christmas and this year she started her present-buying in July when she armed herself with a suitcase to carry everything home - and shared a snap of this year's tree on Facebook, right. 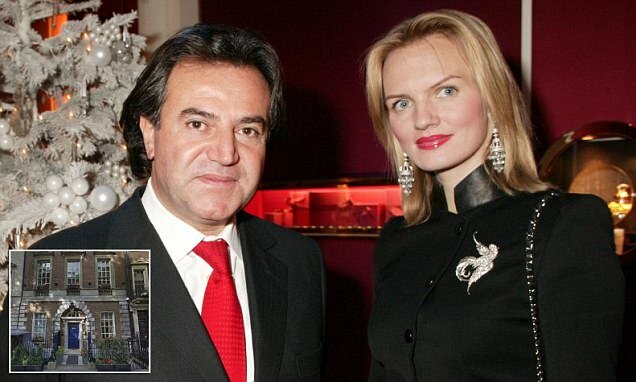 Sir Chris Hohn (pictured), 50, divorced his American wife Jamie-Cooper Hohn and was ordered to give her a third of his fortune at the time - £337m. Turkey is in danger of being overtaken as the centrepiece of the Christmas dinner table. Free-range goose and other more upmarket offerings have seen a surge in popularity. Members of the Communication Workers Union (CWU) who work as counter staff plan to walk out for three days on December 19, 20 and 24. Cash handlers will strike on the 22nd and 23rd. EXCLUSIVE: Alexander Yakovenko said the Kremlin did not see Britain as a threat and hoped for 'real co-operation', as he downplayed Russia's ships in the English Channel. A policewoman was caught talking on her iPhone while at the wheel of her patrol car in north London and the Met has since launched an investigation into the 'irresponsible' incident. 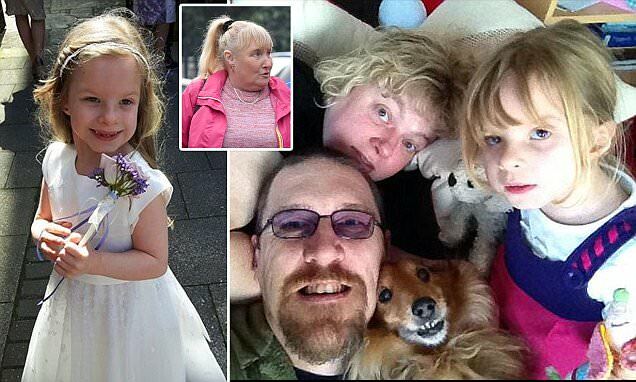 Keziah Flux-Edmonds (pictured left) was killed by her father Darren (right with his daughter and wife Nikki), 44, who drowned her in the bathtub of the family home in East Cowes, Isle of Wight before laying her body in the master bedroom. The father-of-one also killed the family's two terrier dogs. Keziah's lifeless body was found with her arms wrapped around her beloved pets Arnie and Maximus. Both the dogs were soaking wet and it is believed Flux-Edmonds drowned them too. Flux-Edmonds, who suffered from depression, was looking after Keziah while her mother Nikki Flux-Edmonds was at work for an hour. He sent her a chilling text 25 minutes after she left the house. The inquest heard the long message began with 'Congratulations' and ended with: 'You have left me with nothing, I'll leave you with only memories.' Keziah's grandmother June Lillian Flux is pictured inset leaving the inquest today. Chancellor Philip Hammond suggested for the first time there would be a review of the controversial target of spending 0.7 per cent of national income on foreign aid. 207 shares Put our needy elderly first! The Mail has led the way in chronicling how British taxpayers' money has been squandered overseas. Here are some of the most egregious examples of how YOUR money has been spent. Taking a swipe at Cabinet colleagues opposed to the idea, Hammond said there was an 'emerging opinion' among businesses and 'thoughtful politicians' that a transitional deal after Brexit will be needed. The Lord Chief Justice will consider whether to free the jailed commando Alexander Blackman (pictured) while he awaits the start of a fresh appeal against his murder conviction. The Duke of Edinburgh's softer side was revealed in footage of intimate family moments shown on television today as part of a documentary marking the 60th anniversary of his award scheme. 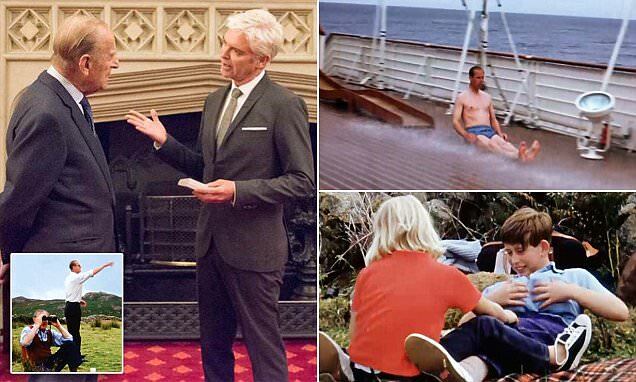 The previously unseen images looked back at the 1960s and touching moments between the Royal couple and their children, with Philip even seen bowling cow pats (inset) for a young Prince Charles to bat away, while the young Prince of Wales was also seen larking about with friends (bottom right). The Duke of Edinburgh was seen messing around in his bathing suit aboard the Royal Yacht Britannia, sliding along the wet deck (top right). The hour-long special featured Prince Philip being interviewed by 'daytime television royalty' Phillip Schofield (left). The Duke's youthful good looks in his naval days even drew comparisons with James Bond due from some smitten viewers on social media. The monarch, who rarely attends funerals apart from for members of the Royal Family, demonstrated her affection for her confidante by joining mourners at the Royal Chapel of All Saints in Windsor Great Park. A new review has found that trainer insoles are not effective in preventing over all injuries. The team from Trobe University in Melbourne Australia looked at past studies done on the inserts. Scientist Dr Seung-min Park has come up with a simple blood test that profiles the genes of lung-tumour cells that is fast with results in hours and 600 times cheaper. Former Tory minister Jim Prior, who served under Ted Heath and Margaret Thatcher, dies aged 89 Former Tory minister Lord Prior has died aged 89. 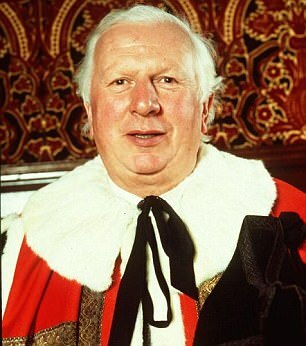 He served for five years in Margaret Thatcher's cabinet where he was seen as one of the leading 'wets' who opposed her economic policies. Before the start of the four day hearing Brexiteers thought all judges would vote with the Remain side and grant power to Parliament to discuss Article 50. Donald Trump has phone call with the First Minister of Scotland who called him 'deeply abhorrent', Nicola Sturgeon, to discuss' long-standing relationship between Scotland and the US' - and he phoned HER! During the telephone call, Scotland's First Minister congratulated Trump on his election win and 'expressed her belief in the values Scotland and the United States share'. New MP Clive Lewis, 45, who entered the Commons only at the 2015 General Election, is said to be planning to take over as leader, with several people touting him as a serious candidate. The veteran left-winger declared £25,000 from the Rail, Maritime and Transport Union (RMT) and another £10,000 from Aslef over the summer. Lee Nutley was found on his sofa in October this year by his father who became worried when his son did not answer the door to his flat on the street where Benefits Street was filmed in Stockton. Lilibeth Ambler-Lomax was last seen by her father at Huddersfield railway station in West Yorkshire yesterday. The girl was due to get a train to York after visiting her father, but failed to return home. Ronan Costello, 17, died three days after the collision, which took place during the first half of an under 19s rugby match at the Dram Centre, in Huddersfield, West Yorkshire, on June 11. A driver broke both his legs when he was run over by his own car during a trip to the beach. The car went so far under the sea at Penmaenmawr, near Conwy, North Wales, only the roof was showing. Barnaby Cork, four, died on the way to hospital after suffering severe head injuries caused by the collision at Thame Leisure Centre in Oxfordshire. His parents described the boy as their 'world'. Mother Julie Hewitt, 39, claims she is entitled to a subsidy for her petrol money to drive daughter Connie to school because they live more than three miles away in Bodmin, Cornwall. Walter Swinburn, three-time Derby winner and one of the most talented jockeys of his generation has died. Swinburn, 55, who has been suffering from epilepsy, passed away peacefully at his London home. 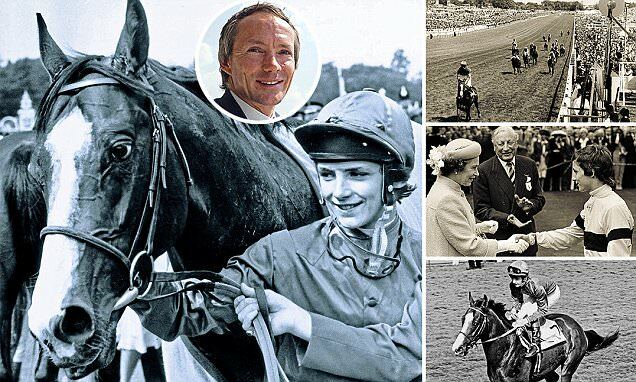 The former jockey, who also had a brief career as a trainer, will be forever linked with the great Shergar, the 1981 Derby winner. Roger Freestone, 67, stayed with his wife Maureen, 65, as the flames ripped through the detached property in Somersham, Cambridgeshire, on March 28. Zoe McAllister, 22, from Oxfordshire, posted photographs on Facebook showing her limp tree and it has been shared thousands of times. Keith Lewin, 59, pictured, from Lancashire, suffered with back pain since his childhood, but his issues spiralled out of control in middle age and led to a devastating diagnosis in 2012. Lauren Atkinson, pictured, was found dead in her hotel room after taking the party drug after attending a sell-out rave with girlfriends in Manchester. Kelly Doyle, 35, currently has to climb through the back window to get in and out after she claimed workmen damaged the front door and lock of her terraced home in Whiston, Merseyside. Karen Kujawa, from Holmes Chapel, Cheshire, lost her daughter Elizabeth Buckley when a 'petrol head' on a first date tried to impress the teenager and lost control of his Toyota at speeds of 60mph. Ralph Clarke (shown) told Birmingham Crown Court the offences against the schoolboy were 'something that happened' and said he was 'immune to feelings' following his arrest last year. Peter Morgan, 54, strangled Georgina Symonds, 25, at her bungalow in Llanmartin, Newport, after discovering she planned to 'fleece him', leave him and work for other men. Michael Boothman, pictured, lost control of his delivery truck in Lincolnshire in January, having taken a corner too quickly, crashing into Brian Dickenson, 82 and his wife Ruth, 77. Belgian Zakaria Boufassil handed £3,000 in housing benefits to Mohamed Abrini in a park in Small Heath, Birmingham in July 2015. Darren Byrne was today found guilty of murdering spouse Maria, 35, in the kitchen of their £450,000 home in Theydon Bois, Essex. Mumtaz Member, 56, was found dead by police a year ago today at her house in Leicester with 'brutal' head injuries - and her family have told of going through a 'horrific experience'. Simon Halabi (left), 58, allegedly shouted 'f*** off out the way you black c***' at Carl Thomas when the bin lorry stopped in the middle of the road to pick up rubbish bags in London's Mayfair (right). Halabi, who was once Britain's 12th richest man before declaring bankruptcy in 2010, also branded the 47 year-old West Indian a 'monkey' and a 'peasant' before shouting 'I own this road, I can do what I want', it is claimed. Rachid Nejjar, 71, of Casablanca, Morocco, allegedly crept up behind four young women watching the ceremony at The Royal Mews outside Buckingham Palace in London. Nigel McGrath, 45, was found hanged at his isolated farmhouse in west Wales and his partner Tracy Cockrell was dead on the sofa, having been strangled. Vladimir Bukovsky, 74, pictured, would 'constantly' download indecent material of children, with a particular emphasis on young boys, over a 15 year period, Cambridge Crown Court heard. The shocking dashcam footage, which was taken on the M11 near London, shows vehicles swerving to desperately avoid the van, which was straddled across two lanes. The 42-year-old woman had just left Old Boathouse in Astley, Greater Manchester when she was bundled into a Transit van by three men. 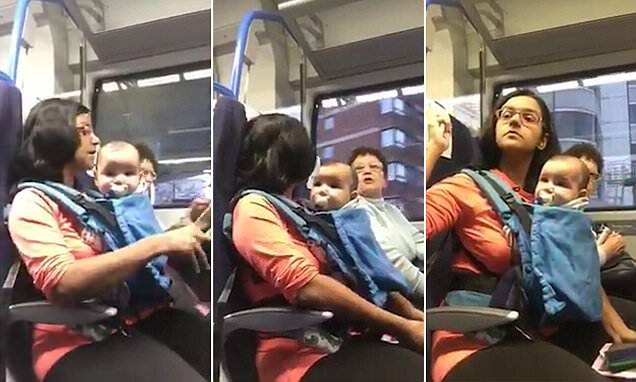 Tosin Femi Olasemo, 38, from Cardiff, pretended to be an American serviceman fighting in Afghanistan and duped women into believing his name was Captain Morgan Travis. 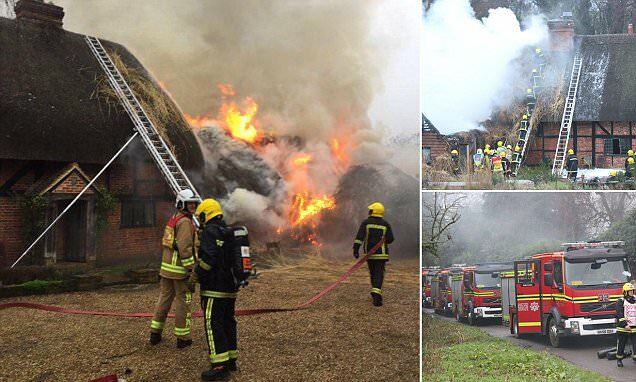 A grade II listed farmhouse in Braishfield, Hants, owned by TV mogul David Frank, caught fire after it spread from a nearby property. Fire-fighters were called on Monday at 12.21 pm after the historic red brick and timber thatched house was reported a blaze. David Frank is the founder of the company behind such international hits as The Secret Millionaire and Wife Swap. Rare etchings, which picture The Artful Dodger, top left, Bill Skypes, top right, Oliver lower left and Fagin lower right are being sold by auctioneers Sotheby's with a pre-sale estimate of £3,000. Survivors of the crash have instructed expert injury lawyers to take legal action against transport operators.The injured are calling for lessons to be learned so a similar incident can be avoided. Seven million viewers - a 20 per cent share - watched as Matt Terry was crowned winner of this year's ITV show. It was a drop of 1.4million from 2015, when 8.4million watched. The studio at Glaspant Manor is where Genesis made their final album with Peter Gabriel The Lamb Lies Down on Broadway in 1974. Gloucestershire Police issued the alert to help find Elizabeth Manley, 49, who had last been seen in Cambridge on Saturday, but many people criticised the reference to her as 'chubby'. Heather Ilott, 55, pictured, was left with nothing when her mother Melita Jackson wrote her out of her will 'in spite' and gave it to charity instead. Tiny portraits of Jane Austen have been added to four of the new £5 notes by micro-engraver Graham Short (engraved note right, top and bottom). 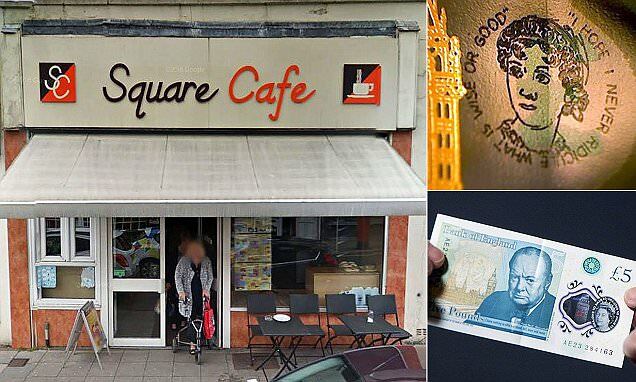 It was revealed today that one of the notes was spent in the Square Cafe in Blackwood, south Wales (pictured left) at the end of last week. If the cafe owner did not notice, the note could have been given out in change and now be in someone's wallet or circulating. Just hours earlier a burst main had left this London suburb submerged under 3ft of water, But the clean-up in Stoke Newington was in full swing today as people returned to their homes and businesses. The red sports car is said to have sent at least one of the pedestrians 'flying over the railings' of a bridge just yards from Battersea Dogs Home in Battersea Park Road (pictured), south-west London, this morning. An order banning National Action was laid before Parliament today by Home Secretary Amber Rudd - the first time membership of a far-right group has been outlawed in the UK. Jonathan Simpson, 48, and his property lawyer wife Katherine, 49, sent letters to the single mother's family claiming she had tried to get pregnant by him. The guidance in a document on 'increasing participation in women and girls' football' was spotted by Carol Hughes, deputy headmistress of Lumley Junior School in County Durham. Best Buy associates at Valley Stream, NY gift a teen with a Wii U. The Syrian army says it has gained control of 98% of eastern Aleppo (inset), leaving only a tiny enclave packed with rebels and civilians. The military's statement said pro-government forces have seized control of al-Fardous, one of the largest neighbourhoods in eastern Aleppo, which has been held by the rebels since 2012. If President Bashar al-Assad seizes complete control of the city it would be his greatest victory yet in the five-year civil war. Zakaria Malahifji, a rebel leader, admitted: 'The situation is extremely difficult today'. 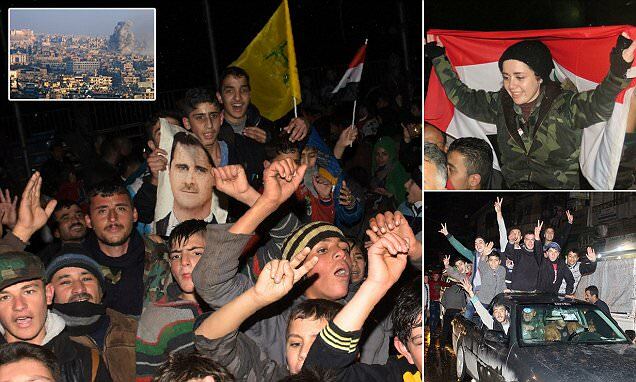 Crowds of civilians have (top and bottom right) been seen celebrating the advances in Assad-held sectors of the city, waving their country's national flag in the air along with portraits of the president (pictured). The footage was broadcast in Russia on state-owned channel Rossiya 24 and in some of the more gruesome footage the soldiers can also be seen inspecting the rebel's corpses. 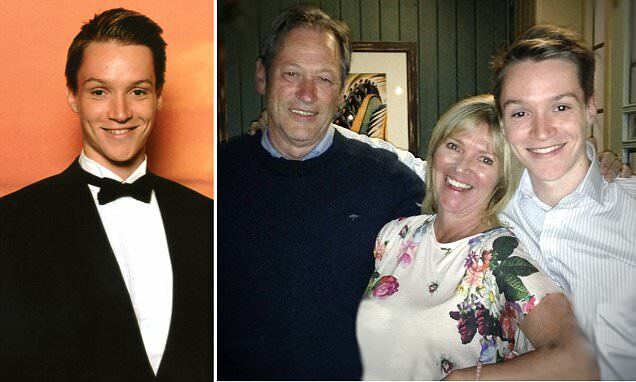 Brothers Jack and Harry Williams, who co-wrote the hit BBC drama, revealed they were inspired by 'genius' detective Jean-Francois Abgrall, who cracked the case of a serial killer in France. Pictures from the scene have shown flames engulfing part of the Oceania residences high-rise block on the Palm, Dubai, which appears to have started in one of the penthouses. The Munich-based European Janusz Korczak Acaedmy are hoping to pair ordinary Germans with their Jewish counterparts so they can talk about their lives and end anti-Semitism. Nineteen players from Chapecoense were among the 71 killed when their plane crashed down on its way from Santa Cruz, Bolivia to Medellin, Colombia last month. A previously unknown drawing by Leonardo da Vinci of the martyr San Sebastian has been valued at £12.6m after being brought in for valuation out of the blue by a retired French doctor. A manhunt is underway after the gang of four thieves targeted the van on a major road near the town of Dardilly, near Lyon in France. International Monetary Fund chief Christine Lagarde went on trial today, accused of negligence for allowing the French government to give Bernard Tapie a £338million bailout. 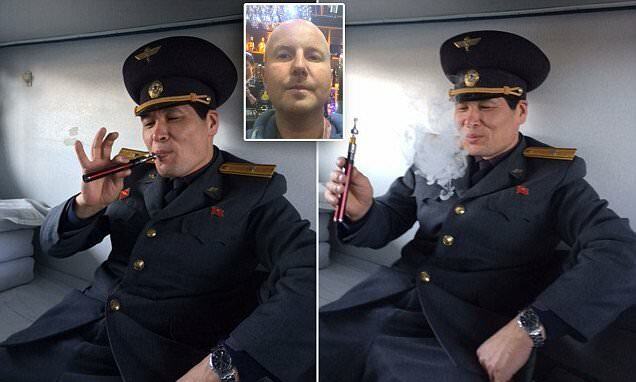 A baffled North Korean border railway guard took his first puff of an electronic cigarette that he confiscated from British tourist Del Dinsdale (inset). The official thought the e-cig was a 'bomb' but gave it a try once Mr Dinsdale explained it was a vapour cigarette. Strict rules in the communist country means tourists are usually forbidden from taking photos of officials but the guard was so amazed that he happily posed for photos. Cologne will have 1,500 police officers on the ground at the city's New Year's Eve celebration this year. In 2015, there were 600 reports of women sexually assaulted by migrant men at the event. The party of populist anti-Islam MP Geert Wilders is now the most popular party in Holland after he was found guilty of discrimination against Moroccans last week. Minutes from an internal meeting of EU ambassadors in Brussels suggest introducing a 'filter function of the external borders', according to reports in Germany. President Nicolas Maduro announced Sunday that Venezuela's largest bank note would be defunct. 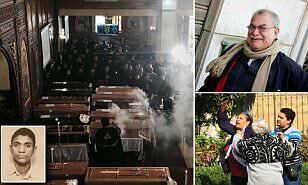 Citizens rushed to cash machines and only have ten days to exchange their £100-bolivar bills. A Moroccan asylum seeker allegedly followed a woman into the toilet of a nightclub in Germany and raped her when she rejected his advances. The incident happened in the Bar 99 Cent, in Hamburg. DAMIAN THOMPSON: What a wretched mess! Ministers have decided to raise council taxes in a much too belated attempt to solve the crisis of elderly care. DAILY MAIL COMMENT: One of the benchmarks of a civilised society is that it treats its elderly with dignity and guarantees they will be looked after when they can no longer look after themselves. Mr Malone has disclosed that he now wears earplugs when he steps outside his house. He does so because Britain has become so infernally noisy.